Let who will boast their courage in the field, I find but little safety from my shield, Nature’s, not honour’s law we must obey: This made me cast my useless shield away. 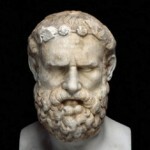 Archilochus was a Greek lyric poet from the island of Paros in the Archaic period. He is celebrated for his versatile and innovative use of poetic meters and as the earliest known Greek author to compose almost entirely on the theme of his own emotions and experiences.